Dr. Thy Nguyen, the oldest of 3 kids, began his undergraduate career at the University of California, Riverside. There he obtained a Bachelor’s Degree in Biology. At the same time he earned his certifications in phlebotomy and pharmacy technician knowing he wanted to enter a career in health care. Following his undergraduate studies at UC Riverside, Dr. Nguyen continued his education at the Southern California University of Health Sciences, where he obtained is Doctorate of Chiropractic degree. During this time he did his internship at various clinics including the Pasadena University Health Center, Mount San Antonio College Student Health Center, and lots of sporting events where he performed sports physicals and training. 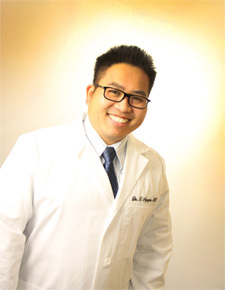 After finishing obtaining his doctorate degree, Dr. Nguyen began practicing in Pomona. He later accepted a position as the clinical director for a multi-disciplinary clinic where he worked alongside orthopedic surgeons, internists, psychiatrists, acupuncturist, and therapists to better the patient care and return them to full health as soon as possible. Dr. Nguyen has now moved on to his own private practice, Thy K. Nguyen, DC Chiropractic, where he can apply all his experience and knowledge to help better serve and bring a person back to their active lifestyle.